Laurie and Raphael, the owners, will be happy to welcome you in an independent house, renovated (furnishing, decoration and appliances). You will stay in an independent contemporary house on the heights of Aix les Bains, located in the commune of Pugny Chatenod, in the heart of the Bauges Nature Park. 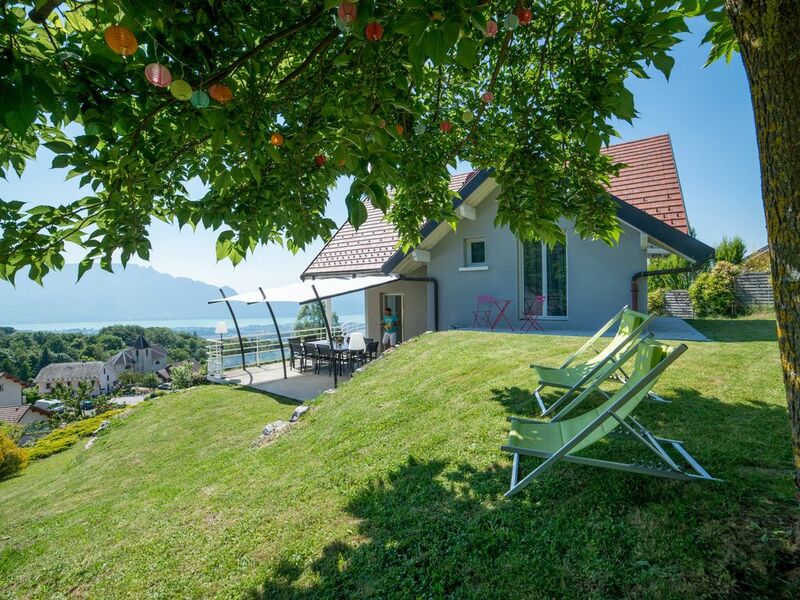 House near Savoie Grand Revard ski resort, Lake Bourget and 30 minutes from Chambéry and Annecy. Quiet villa on a plot of 1400 m2 with panoramic views of the largest natural lake in France. Large terrace with outdoor lounge and barbecue. A large living room with kitchen, wood stove, sitting area with flat screen TV 150cm. 4 bedrooms, 2 separate toilets, 2 bathrooms, 1 laundry and a large garage that can accommodate a car. Free WIFI. Miscellaneous: Long-term rental possible, children welcome, non-smoking, no disabled access. We had a wonderful week at this property - views over Lac Du Bourget were amazing. The property was very clean and well maintained and had everything you require. The description is accurate. There is lots of space around the house for storage etc. Lots of activities are within easy reach - Aix Les Bains and Annecy well worth a visit. Mountain peaks also a short drive away with views to Mont Blanc on a clear day. Laurie was very welcoming and met us on arrival and when we left. We would love to return. Thank you so much for your comment. That was a real pleasure to meet you and your lovely kids. I hope you enjoy your stay in Morzine too. What a beautiful stay we had in Pugny-Chatenod! Raphael and Laurie are very friendly and they gave us the feeling being at home in their gite. The house is close to Lac du Bourget for enjoying the lake and close to the mountains as well. The house is perfectly equipped! Wir haben sehr schöne Tage verbracht. Wir können es nur weiterempfehlen. Ein Haus mit sehr schönen Ausblick. Wir waren mit 8 Personen und zwei Kindern über Silvester in diesem schönen Haus. Das Haus ist sehr geräumig und hat alles was man benötigt um ein paar schöne Tage zu erleben. Die Aussicht auf das Tal ist atemberaubend. Nach einem Stromausfall war der Vermieter sofort zur Stelle um zu helfen. Im Sommer ist es bestimmt auch toll wenn man an den See kann oder sonstige Aktivitäten machen kann. Ce fut un plaisir partagé de vous accueillir, vous et vos amis dans notre maison de vacances. Des locataires qui nous rendent une maison dans un tel état de propreté, nous en voulons toutes les semaines! Nous espérons que vous allez tous bien. Au plaisir de peut-être vous recroiser sur nos terres Savoyardes! Cordialement, Laurie et Raphaël. Geräumiges Haus für 2 Familien (wir waren 4 Erwachsene und 5 Kinder). Insgesamt sehr gut unterhalten und ausgestattet und sogar mit ordentlichen Betten (was in Ferienwohnungen nicht immer gewährleistet ist). Uns fehlte es an Nichts, und wenn doch mal etwas zu bemängeln war, hatte man in der Verwaltung einen zuvorkommenden Ansprechpartner, die sich sofort gekümmert hat. Die Aussicht über den See fasziniert jeden Tag erneut. Man ist sehr abgeschieden und Einkäufe im Supermarkt zählen schon als Ausflug. Wir haben die Zeit sehr genossen und können die Gîte Laurie Raphael nur wärmstens empfehlen. Das Haus ist sehr gepflegt, großzügig und bestens ausgestattet. Thank you very much Dirk. That was a real pleasure to receive you in our house. Enjoy your summer. Sled dogs. Skidoo. Snowshoes. Tree climbing. Parachute. Via ferrata. Cruise on the lake. Sailing. Rental boat. Hiking. Escalade.